Stephen Palmer was born on 20 January 1685 or 1686. He was the son of Timothy Palmer and Hannah Buell. John Ellsworth married Lucia Bower. Lucia Bower married John Ellsworth. Lt. John Bissell was born at England. He was the son of Capt. John Bissell and Mary Drake. Lt. John Bissell married Isabel Mason on 17 June 1658 at Saybrook, Middlesex Co., CT. Lt. John Bissell died in 1688 at Military Service, NY. [S121] Judge Pelham St. George Bissell, Descendants of John Bissell, Page 1/Item 2-2. Thomas Bissell was born at England. He was the son of Capt. John Bissell and Mary Drake. Thomas Bissell married Abigail Moore, daughter of Deacon John Moore, on 11 October 1655 at Windsor, Hartford Co., CT. Thomas Bissell died on 31 July 1689 at Windsor, Hartford Co., CT.
[S52] Henry R. Stiles History of Ancient Windsor II, Vol. II:Pg. 77-78. [S121] Judge Pelham St. George Bissell, Descendants of John Bissell, Page 2/Item 2-3. Mary Bissell was born at England. She was the daughter of Capt. John Bissell and Mary Drake. Mary Bissell married Jacob Drake, son of John Drake and Elizabeth Rogers, on 12 April 1649 at Windsor, Hartford Co., CT.
[S121] Judge Pelham St. George Bissell, Descendants of John Bissell, Page 1/item 2-1. Jacob Drake was the son of John Drake and Elizabeth Rogers. Jacob Drake married Mary Bissell, daughter of Capt. John Bissell and Mary Drake, on 12 April 1649 at Windsor, Hartford Co., CT. Jacob Drake died in September 1689. Nathaniel Bissell was born on 24 September 1640 at Windsor, Hartford Co., CT. He was the son of Capt. John Bissell and Mary Drake. Nathaniel Bissell married Mindwell Moore, daughter of Deacon John Moore and Abigail Phinney, on 25 September 1662 at Windsor, Hartford Co., CT.3 Nathaniel Bissell married Dorothy Fitch, daughter of Rev. James Fitch and Abigail Whitfield, on 4 July 1683 at Windsor, Hartford Co., CT. Nathaniel Bissell died on 12 March 1713/14 at Windsor, Hartford Co., CT, at age 73. [S52] Henry R. Stiles History of Ancient Windsor II, Vol. II:Pg. 78. [S121] Judge Pelham St. George Bissell, Descendants of John Bissell, Page 3/Item 2-6. [S121] Judge Pelham St. George Bissell, Descendants of John Bissell, Page 3/Item 2-5. Moved to Simsbury 1667-9; left there after the burning of the town by Indians, 1676; was afterwards employed in surveying Ellington, where he settled. The Hon. Judge Benjuamin Pinney of Ellington, in a latter dated 24 May 1850, says: "We can show you the homestead where Samuel Pinney built his log-house; and I feel proud in saying that the land bought by him from the Indians is now in the hands of my son William, and two half brothers nelson and Andrew Pinney, and it has never been in other hands than the Pinneys. It is the only tract of land in this town which has nover been conveyed by deed from the family descendants. Of this tract no deed can be found but the Indian title to Samjuel Pinney." Samuel Pinney was born at Dorchester, Suffolk Co., MA. He was the son of Humphrey Pinney and Mary Hull. Samuel Pinney married Joyce Bissell, daughter of Capt. John Bissell and Mary Drake, on 17 November 1665 at Windsor, Hartford Co., CT.2 Samuel Pinney died after 1681 at Ellerton, CT.
Richard Porter was born on 24 March 1658. He was the son of Daniel Porter and Mary (?) Richard Porter married Ruth Holcombe, daughter of Joshua Holcombe and Ruth Sherwood, circa 1685/86.1 Richard Porter died in 1739 at Alexandria, LA. Richard was given 40 acres of land, part of a farm lying in Wallingford and abutting Farmington, by his father "bonesetter" Daniel Porter. There was a Richard Porter, son of Arthur, in County Somerset during the reign of Henry VIII. Somerset county is where Bowman believes Thomas Holcombe lived just prior to his emigration to America. Ruth and Richard had the following children 1, 2, and 3 listed in "The Connecticut Nutmegger", Sept 1992/218, Child # 4 is from IGI index. Dr. Daniel Porter was born in 1653. He married Deborah Holcombe, daughter of Joshua Holcombe and Ruth Sherwood, before 1699. Dr. Daniel Porter died in 1727. Elizabeth Gibbs Moore was born in 1763. She was the daughter of Jonah Moore and Mary Ridout. Elizabeth Gibbs Moore married Phinehas Holcombe, son of Reuben Holcombe and Susanna Hayes, on 26 April 1781 at Congregational Church, Turkey Hi.1 Elizabeth Gibbs Moore died on 15 September 1826 at West Hill, New Hartford, Litchfield Co., CT. She was buried at Town Hill Cemetery, New Hartford, Litchfield Co., CT.
"The family of Phinehas, Jr. lived almost at the top of West Hill on the opposite side of the road from his father. The dwelling was built by Phinehas, Jr. in 1809-10. It was subsequently owned by a Mr. Rowley, then by John Roberts of Litchfield, who was the father-in-law of Friend Holcomb. Then Friend's son Hubert occupied the dwelling. Phinehas, Jr. must have been a farmer, either on his own or working with his father. Phinehas, Jr. died suddenly in West Granby of the "fever" , as recorded in the sexton's book of burials. unfortunately we know nothing more about him." [S75] Holcombe. Seth P., Phineas Holcomb, Page 2/Item 2. [S25] Hannah McPherson, Holcombe Genealogy, Page 123.2/Item A-8-1-2-6-4-1. [S807] Find A Grave, online http://www.findagrave.com, Find A Grave, database and images (https://www.findagrave.com : accessed 13 April 2019), memorial page for Hannah Crofout Holcomb (1741–1 Jun 1825), Find A Grave Memorial no. 51549746, citing Ulster Cemetery, Ulster, Bradford County, Pennsylvania, USA ; Maintained by Lori (contributor 47185966) . Selah Holcombe was born on 4 September 1767 at Barkhamsted, Litchfield Co., CT.2,3 He was the son of Capt. Eli Holcombe and Hannah Crofut. Selah Holcombe married Sarah Wilcox in November 1790 at Congregational Church, Norfolk, Litchfield Co., CT. Selah Holcombe died on 4 August 1842 at Litchfield, Herkimer Co., NY, at age 74. Seelah moved from Granby in 1791 to Litchfield Twp., Herkimer Co., NY whre he was appointed Agust 27, 1798 ensign in the county's militia; promoted to Lt, apr. 18, 1800; appointed Capt. March 27, 1809; resigned as Capt. March 2, 1814; became a wealthy farmer. [S25] Hannah McPherson, Holcombe Genealogy, Page 137.1/Item A-8-1-2-13-2. Information from Wade G. Holcombe. Truman and Seba settled first at LeRoy; after a residence of a few years there, they moved to Ulster and settled permanently upon a portion of the farm of his father, the Eli Holcomb homestead. 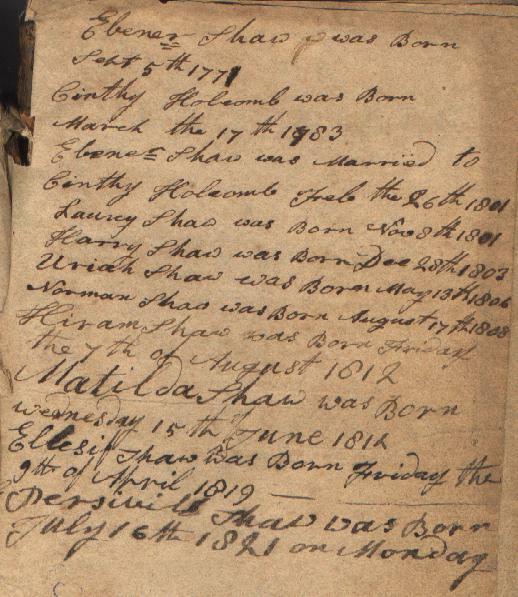 The Pioneer and Patriot Families book seems to indicate that they were married in 1812 without giving a specific date. In 1800, Truman Holcomb, a brother to Hugh and Sterling, came from Ulster and moved into a house on the A. G. Kelley farm, occupied by William Cole and Joel Bodwell, and Isaac Wooster located on the same farm farther north. Truman Holcomb took up a farm close by and remained on it twelve years, then returned to Ulster. He was the father of sixteen children, eight by his first wife and eight by his second. His son Eli, who is now eight-four years of age, still lives in the township a little to the south of the village, where he settled in 1819. He has a family of thirteen children, nearly all of whom are the heads of families. He has succeeded well as a cooper, hunter, miller, and farmer. Truman was enumerated in the 1840 Ulster, Bradford Co., PA, federal census. Other family members were enumerated nearby. There were two very young girls in the household. [S23] Jesse Seaver, The Holcomb(e) Genealogy, Page 80/Item 240. [S65] Deanna Holcomb Bowman Thomas Holcomb, Vol. I:Pg. 156/Item 812b5. [S25] Hannah McPherson, Holcombe Genealogy, Page 138.1/Item A-8-1-2-13-3. [S807] Find A Grave, online http://www.findagrave.com, Find A Grave, database and images (https://www.findagrave.com : accessed 13 April 2019), memorial page for Truman Holcomb (9 Jul 1769–24 Dec 1848), Find A Grave Memorial no. 120013597, citing Ulster Cemetery, Ulster, Bradford County, Pennsylvania, USA ; Maintained by LDR (contributor 47171969) . Hannah Holcombe was born on 3 April 1771 at Barkhamsted, Litchfield Co., CT.1,2 She was the daughter of Capt. Eli Holcombe and Hannah Crofut. Hannah Holcombe died on 29 January 1850 at LeRoy, Bradford Co., PA, at age 78. Information online from Pioneer and Patriot Families of Bradford County, 1770-1800, Volume 1, by Clement F. Heverly. Deacon Seeley Crofut started the first Sunday-school in an old log school house, opposite the present residence of S. B. Morse. He was elected justice of the peace in 1812. He served in many positions of trust, by the choice of his neighbors. He kept the first grocery or store in the township. The Baptist meetings were for many years held at his house. Sterling is recorded in the 1840 census of LeRoy, Bradford Co., PA, with 3 males and 3 females in the household. [S65] Deanna Holcomb Bowman Thomas Holcomb, Vol. I:Pg. 156. [S104] DAR DAR Lineage book, Vol. LXXII:Pg. 3/Item 71005; Vol LXXXIV:Pg. 200/Item 83528. [S25] Hannah McPherson, Holcombe Genealogy, Page 142.2/Item A-8-1-2-13-5. [S25] Hannah McPherson, Holcombe Genealogy, page 142.2. [S807] Find A Grave, online http://www.findagrave.com, Find A Grave, database and images (https://www.findagrave.com : accessed 13 April 2019), memorial page for Sterling Holcomb (10 Oct 1776–22 Mar 1850), Find A Grave Memorial no. 37699519, citing Leroy Cemetery, Leroy, Bradford County, Pennsylvania, USA ; Maintained by Crowfoot (contributor 46927636) . Hugh moved with his father to Ulster, PA, about 1786 or 1806, later locating at LeRoy, then a wilderness and located lands for their future home, then fourteen miles from any habitation, his lands extendng from the village of LeRoy to the top of the first hill on the road to Canton; his brother's lands adjoining and extending on his road to the top of the second hill. Soon after location they brought in their sister, Mrs. Crofut, and her husband. For a few years she did washing and baking while they kept bachelor's hall. He built the first saw mill and grist mill in that section of the country. Both Hugh and Sterling cleared up large farms which they carved out of a rugged wilderness and upon which their lives were spent. Hugh was recorded in the 1840 census of LeRoy, Bradford Co., PA, with a household of 2 males and 2 females. [S23] Jesse Seaver, The Holcomb(e) Genealogy, Page 82/Item 241. [S25] Hannah McPherson, Holcombe Genealogy, Page 141.1/Item A-8-1-2-13-4. [S65] Deanna Holcomb Bowman Thomas Holcomb, Vol. I:Pg. 156/Item 812b6. Alpheus Holcomb, a brother of Hugh and Sterling, settled on the flats at the north of the mill-pond at the Centre, where he built a house and set an orchard of apple-trees. Having a roving nature, he soon sold his farm, and went westward. After a few years he returned, and settled on the Robert McKee farm. He was deacon in the Baptist church, and was for many years considered one of the leading lights. Alpheus served as a private in Lt. William Aull's detachment, enlisted Jul 25, 1814, at Franklin, Sussex Co., NJ. Alpheus was recorded in the 1840 census of LeRoy, Bradford Co., PA, with his wife and one other female in the household. [S104] DAR DAR Lineage book, Vol. LXXIV:Pg 41/Item 73104. [S25] Hannah McPherson, Holcombe Genealogy, Page 143.1/Item A-8-1-2-13-6. [S25] Hannah McPherson, Holcombe Genealogy, page 143.1. [S807] Find A Grave, online http://www.findagrave.com, Find A Grave, database and images (https://www.findagrave.com : accessed 13 April 2019), memorial page for Alpheus Holcomb (10 Jan 1779–19 Jan 1849), Find A Grave Memorial no. 99444030, citing Leroy Cemetery, Leroy, Bradford County, Pennsylvania, USA ; Maintained by LDR (contributor 47171969) . Jared and Hannah had no children. Jared and the widow McCarty apparently had at least two children. Jared was enumerated in the 1840 Ulster, Bradford Co., PA federal census. There were 3 males and 3 females in the family. [S25] Hannah McPherson, Holcombe Genealogy, Page 143.2/Item A-8-1-2-13-7. [S807] Find A Grave, online http://www.findagrave.com, Find A Grave, database and images (https://www.findagrave.com : accessed 13 April 2019), memorial page for Jared Holcomb (4 Nov 1780–26 Apr 1850), Find A Grave Memorial no. 120016131, citing Ulster Cemetery, Ulster, Bradford County, Pennsylvania, USA ; Maintained by LDR (contributor 47171969) . Cynthia Holcombe was born on 17 March 1783 at Barkhamsted, Litchfield Co., CT.3,4,5 She was the daughter of Capt. Eli Holcombe and Hannah Crofut. Cynthia Holcombe married Ebenezer Shaw, son of Jeremiah Shaw and Abigail Campbell, on 26 February 1801 at Ulster, Bradford Co., PA.6,3 Cynthia Holcombe died on 10 April 1868 at Ulster, Bradford Co., PA, at age 85. Ebenezer was enumerated in the 1820 Ulster, Bradford Co., PA, federal census. There were six males and four females in the household. [S104] DAR DAR Lineage book, Vol. 71/Item 70174. [S25] Hannah McPherson, Holcombe Genealogy, Page 143.2/Item A-8-1-2-13-8. Louisa Holcombe was born on 1 October 1802 at LeRoy, Bradford Co., PA. She was the daughter of Sterling Holcombe and Betsey Stone. Louisa Holcombe married Levi Taylor on 6 September 1821 at LeRoy, Bradford Co., PA.3 Louisa Holcombe died in 1838. [S25] Hannah McPherson, Holcombe Genealogy, Page 143.1/Item A-8-1-2-13-5-2. Silvia Holcombe was born on 6 September 1804 at LeRoy, Bradford Co., PA. She was the daughter of Sterling Holcombe and Betsey Stone. Hiram Holcombe was born on 5 June 1806 at LeRoy, Bradford Co., PA. He was the son of Sterling Holcombe and Betsey Stone. Hiram Holcombe married Polly Wilcox on 31 August 1823. Hiram Holcombe died on 21 January 1895 at age 88. Hiram is recorded in the 1840 census of LeRoy, Bradford Co., PA with 1 male and 5 females in the household. Hiram is recorded in the 1850 census of LeRoy, Bradford Co., PA, a farmer, age 44, Polly was 40. Hiram was recorded in the 1880 census of LeRoy, age 74, a laborer, with Polly, age 73. [S25] Hannah McPherson, Holcombe Genealogy, Page 143.1/Item A-8-1-2-13-5-4. [S25] Hannah McPherson, Holcombe Genealogy, Page 143.1/Item A-8-1-2-13-5-5. [S386] Jean E. Swanson, "Holcombe, Harry." Benjamin S. Holcombe was born on 22 October 1810 at LeRoy, Bradford Co., PA. He was the son of Sterling Holcombe and Betsey Stone. Benjamin S. Holcombe married Lois Delight Chappell on 22 March 1832. Benjamin was recorded in the 1850 census of LeRoy, Bradford Co., PA, age 40, as a farmer. Lois was 36. Benjamin and Lois D. were enumerated in the 1870 LeRoy, Bradford Co., PA, federal census. He was a saw mill owner, age 59, she was 56. Children in the household were K. J. 16, and M.S. 12. Benjamin was recorded in the 1880 census of LeRoy, age 68, as a laborer, with Delight, age 66. [S25] Hannah McPherson, Holcombe Genealogy, Page 143.1/item A-8-1-2-13-5-6. Sarah Holcombe was born on 14 September 1812 at LeRoy, Bradford Co., PA. She was the daughter of Sterling Holcombe and Betsey Stone. Seelye Holcombe was born on 14 September 1812 at LeRoy, Bradford Co., PA. He was the son of Sterling Holcombe and Betsey Stone. [S25] Hannah McPherson, Holcombe Genealogy, Page 143.1/Item A-8-1-2-13-5-8. Cynthia attended the 1st Holcombe Reunion at LeRoy, Bradford Co., PA, being 65 years old. Cynthia Shaw Holcombe was born on 12 September 1814 at LeRoy, Bradford Co., PA. She was the daughter of Sterling Holcombe and Betsey Stone. Cynthia Shaw Holcombe married Andrew Eaton Spalding, son of William Pierce Spalding and Eleanor Watts, on 16 June 1836 at Bradford Co., PA; Information online from Pioneer and Patriot Families of Bradford County, 1770-1800, Volume 1, by Clement F. Heverly. Cynthia Shaw Holcombe died in 1893. [S104] DAR DAR Lineage book, Vol. LXXII:Pg. 3/Item 71005. [S25] Hannah McPherson, Holcombe Genealogy, Page 143.1/Item A-8-1-2-13-5-9. Horace Stone Holcombe was born on 24 November 1818 at Bradford Co., PA.2 He was the son of Sterling Holcombe and Betsey Stone. Horace Stone Holcombe married Lucy Elizabeth Allen on 15 February 1842 at Bradford Co., PA.3 Horace Stone Holcombe died on 3 November 1896 at Shenandoah, Page Co., IA, at age 77; of blood poisoning. He was buried at Rose Hill Cemetery, Shenandoah, Page Co., IA. Additional information on Horace is from the Family Search Ancestral File, AFN: 4ZJB-MF. The information was posted by Vera Dillin Combs and Lynette Combs Young of North Platte, NE. Another source is Neil McDonell, adam1984@yahoo.com. Lastly, the bulk of the additional information is from Debra Brannan Mullendore djbrnnn@cs.com, P.O. Box 1011, North Platte, NE 69103. The information and documentation provided by the above researchers confilcts with McPherson. McPherson shows Horace's wife to be Electa Bailey. McPherson, page 141, lists Marlin Holcombe's birth as 26 May 1801 and says that Marlin married Electa Bailey. On page 142-3, she says Horace was born 26 May 1801 and married Electa Bailey. Data from Judson Holcombe's book (mentioned on page 141-2) also attests to McPherson's error. Horace S. and Betsy E. were enumerated in the 1885 Shenandoah, Grant Twp., Page Co., IA, state census. He was 66, she was 67. The only child in the household was Lucy E., age 33. [S25] Hannah McPherson, Holcombe Genealogy, Page 142.2, Item A-8-1-2-13-5-1. Chester Bingham Holcombe was born on 16 July 1820 at LeRoy, Bradford Co., PA. He was the son of Sterling Holcombe and Betsey Stone. Chester Bingham Holcombe died on 14 September 1894 at Gordonsville, MN, at age 74. Information on Chester Holcombe and his descendants provided by Wade Gladstone Holcombe. Chester served as a Unon soldier, mustered October 11, 1861 in co. F. 4th Minn Vo. Inf Regt; discharged for disability, June 16, 1863; moved from PA to the west as a young man; became blind and lived to a very advanced age. Chester and Maryanne were enumerated in the 1880 Shell Rock, Freeborn Co., MN, federal census. He was a farmer, age 59, she was 52. Children in the household were Betsy Miller 38, Henry 25, Sarah 23, Walter S. 18, Horace G. 16, and Charles D. 12. Also in the household were step-children Joseph H. Pareton 24 and Benjamin F. Pareton 20; and grandchildren Emma Mill34 12, Josie Miller 9, Nellie Miller 7, and Sylvia M. Miller 3. [S25] Hannah McPherson, Holcombe Genealogy, Page 143.1/Item A-8-1-2-13-5-12. Neil McDonell cites Memories Along the North Branch: History of Granville by Ruth Kinney. Hannah Holcombe was born on 14 July 1826 at LeRoy, Bradford Co., PA. She was the daughter of Sterling Holcombe and Betsey Stone. A considerable numbr of descendants of this man used the speling Buttles. Dr. Jonathan Buttolph was born on 2 June 1697 at Simsbury, Hartford Co., CT. He was the son of Sgt. David Buttolph and Mary Buck. Dr. Jonathan Buttolph married Martha Holcombe, daughter of Lt. Nathaniel Holcombe and Martha Buell, on 21 February 1723/24 at Simsbury, Hartford Co., CT.3 Dr. Jonathan Buttolph married Elizabeth Cornish, daughter of Deacon James Cornish and Elizabeth Thrall, on 24 April 1729 at Simsbury, Hartford Co., CT. Dr. Jonathan Buttolph married Martha Loomis, daughter of William Loomis and Martha Morley, on 15 February 1758 at Simsbury, Hartford Co., CT. Dr. Jonathan Buttolph died in June 1769 at Simsbury, Hartford Co., CT. There are two Martha's at nearly the same dates that cause some confusion. Bowman explores it completely so she is quoted here. Martha Holcomb, born in 1682, had an heir mentioned in her father's 1740 will. McCraken, in TAG Vol 57 #2, states she married Daniel Hayes in 1716. McCraken reasons that since the will left 20 shilings to Martha's son to buy him a bible that the heir is a minor in 1740. The only Daniel Hayes in records in nearly 25 years old. There is another Martha, born 1706, and listed in Windsor records. Thus Martha's heir could be someone else. Martha was probably dead in 1744 when her sister, Mary, left her estate to her other four sisters. Or, the possibility exists that Nathaniel was referring to one of his other daughters, perhaps Margaret North rather than Martha. A Renee Cossitt, born in 1722-1810, son of Rene and Ruth Porter Cossitt, married Phebe Hillyer, Martha Holcomb, and Martha Barber. He moved to Cape Breton Island, Canada. She is not this Martha Holcomb because Phebe Hillyer Cossit died in 1786, and this Martha would already be dead. Certainly Martha who maried Daniel Hayes belongs in the Holcomb genealogy her exact place can not at this time be proven, so she is listed here. Some confusion in this family was caused by the other Martha's. One of these Martha's died early having only one child. One Martha married Dr. Jonathan Buttolph in 1723. In the book Commemorative and Biographical Record of Hartford County is mention that the Martha who married Jonathan Buttolph was a daughter of Nathaniel (born June 11, 1673). From, New England Genealogies by Reverend Charles W. Hayes, A.M. of Westfield, N.Y; Daniel Hayes, born in 1686, the second child of George Hayes married Martha Holcomb in March 1716. She died in January 1717, and he married Sarah Lee in May 1721. She died in 1738, probably the daughter of John Lee. Daniel married in 1739 the Mary in his will. [S65] Deanna Holcomb Bowman Thomas Holcomb, Vol. I:Pgs 85-6. Daniel Hayes II was born on 20 December 1716 at Salmon Brook Ecclesiastical Society, Hartford Co., CT. He was the son of Daniel Hayes and Martha Holcombe. Daniel Hayes II married Abigail Hayes, daughter of Samuel Hayes and Elizabeth Willcockson, on 13 May 1742 at Simsbury, Hartford Co., CT. Daniel Hayes II died in 1786 at Salmon Brook Ecclesiastical Society, Simsbury, Hartford Co., CT. He died on 8 April 1809 at age 92.3 Daniel and Abigail were cousins, she being the 3rd daughter of Samuel. [S25] Hannah McPherson, Holcombe Genealogy, Page 144.1/Item A-8-1-5-1. [S243] Rev. Charles Wells Hayes, George Hayes, Page 18, Item 7. Thomas Gilbert married Catharine Chapin, daughter of Samuel Chapin and Cicely Penny, on 31 July 1655.1 Thomas Gilbert died on 5 June 1662. John Bliss names this husband of Catherine, Samuel Marshfield. [S65] Deanna Holcomb Bowman Thomas Holcomb, Vol. I:Pg. 5. Richard Birge was born on 15 September 1611 at Ashwick, Somerset, England.2 He married Elizabeth Gaylord on 5 October 1641. Richard Birge died on 10 September 1651 at Windsor, Hartford Co., CT, at age 39. Richard Birge came to the Colonies on the MARY AND JOHN and later founded Windsor, CT.
[S52] Henry R. Stiles History of Ancient Windsor II, Vol. II:Pg. 74. Elizabeth Gaylord was born in 1614 at Exeter, Devonshire, England. She married Richard Birge on 5 October 1641. Elizabeth Gaylord died on 22 December 1675 at Windsor, Hartford Co., CT.